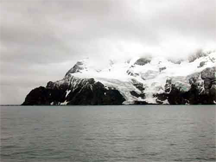 Elephant Island, where Sir Ernest Shackleton and his crew were marooned in 1916. After their ship Endurance was crushed in the Weddell Sea, the Shackleton expedition drifted north on sea ice from 27 October 1915 to 9 April 1916, when they reached the end of the ice and took to open boats for the journey to Elephant Island. There Shackleton left the main body of his crew, and undertook an open boat journey with five others to South Georgia, where he began navigating the bureaucracies of several governments to eventually secure a ship to rescue his marooned crew. At any of dozens of points in this saga, Shackleton could have evaded responsibility and rescued himself, from both the elements and the judgment of history. That he did not avoid that responsibility, and instead embraced it, is a lesson to us all. Leaders, above all others, have opportunities to avoid responsibility with little risk to their reputations. Stories like Shackleton's provide inspiration and insight that are helpful to all leaders, in business, the military and government. Read the story in detail in Roland Huntford's biography of Shackleton, Shackleton. Photo by Mike Vecchione, courtesy U.S. National Oceanic and Atmospheric Administration. If your organization aspires to high performance, it's useful to know who avoids responsibility or the risks of being held accountable. Unless you're astute and alert, you'll eventually be a recipient of responsibility shifted by these shirkers. This little handbook is for you. And if you're among the unfortunate majority who don't work in high-performance organizations, responsibility-shifting skills are essential to survival. Until you find a job somewhere better, this little handbook is for you. Here are some popular techniques people use for avoiding responsibility. I've written it as a handbook for shirkers, but it's also useful for those who want to know how shirkers operate. Working from a remote site makes anyone more difficult to reach, especially in emergencies. Evading responsibility is easier when you aren't there. The best approach is to have the requestor ask someone else. If that doesn't work, inform the requestor that Mortimer is in charge of such things. Be creative. If all else fails, delegate. Tell the requestor to come back later. Offer a particular time only if necessary. As time passes, the request might be overtaken by events, or forgotten, or the requestor might find somebody else to take responsibility. Accept the request, but send the requestor away with "Leave it on my desk," "Send me email," or even better, "Leave it with Melvin," if Melvin is your assistant. (Remember to use your assistant's actual name.) Leave-it-with-my-assistant is best because it makes you seem more important. Only later, apply the techniques below. Tell the requestor that Mortimer must deal with the request first, and after Mortimer does whatever he does, you'll review it. This protects you somewhat in case of later disaster, because you can say that you relied on Mortimer's input. Of course, again, use Mortimer's actual name. Ask the requestor for more information — preferably information that takes time to acquire. During that time, you can prepare to use one of these other techniques. If somehow the request reaches you despite your best efforts, find excuses to delay or to send it back. Be too busy. Play dumb. Make something up. The best excuses involve travel, or people high in the org chart, or travel with people high in the org chart. The requestor must then either find someone else to deal with the request, or go ahead anyway somehow. Either way, you're off the hook. Would you like to see your comments posted here? rbrenmRrjwopKDZIQwOJLner@ChacVfOEPdSBgVbUckecoCanyon.comSend me your comments by email, or by Web form. I offer email and telephone coaching at both corporate and individual rates. Contact Rick for details at rbrennOktHoEsLapldBfiner@ChacFPGXuNgfRNDeQCTOoCanyon.com or (650) 787-6475, or toll-free in the continental US at (866) 378-5470.